I don’t want this to happen on my watch. The devil's goal is to cause all people to hate each other and live for themselves. His motto is "survival of the fittest" and "might makes right." He often works through the news media who basically only report all the lawlessness as though it is sensational and then report what is good in such a twisted way that it seems evil. Other forms of media entertain the masses by celebrating and glorifying what should be abhorrent. If Jesus walked the earth today, He would not be entertained by prime time television with the many Christians who are addicted to it. These factors combined with our fallen nature work together to cause us to hate others and fall prey to cynical thinking. I am certainly prone to this. While I avoid “mainstream media” for the most part, I’m still tempted to view everyone whom I don’t know well with much cynicism. It seems the only remedy is to think biblically about people. People are evil and sinful apart from the redemptive work of God through Jesus (see Romans 3). This is the cynicism part. Because of Christ, we can trust that God is at work in this world now (e.g. John 5:17), restoring people to himself and transforming them from the inside out (e.g. 2 Cor. 5:17). He is working constantly and doing this every day. We never hear about it, because of the devil has a strong grip on the media institutions of our world. The solution is to be salt and light, praying and acting in love as if God is really working in evil people’s lives, through us and the work of the Spirit, transforming them. I can only imagine that if Christians lived this way, got involved in every influential realm of society our world would again be transformed by the Good News of Jesus Christ. Here were the disciples, the future of the Church, and they doubted the adequacy of the Church (really of God working through the Church) to meet people's needs. Do we not often have this same way of thinking today? "Mustard plant bangladesh" by Hopeoflight - Own work. Licensed under CC BY-SA 3.0 via Wikimedia Commons. Rather than tell people to go meet their needs via the government or secular institutions (and we communicate this by not being proactive), God wants us to gather the resources and strengths of each member of the body of Christ and offer them to Him for His purposes. This results in the miraculous Kingdom of Heaven shining brightly in the darkness and people having their needs meet and their sicknesses healed. As we learned in Chapter 13, this seemingly insignificant kingdom transforms and overcomes the whole world! This is why Jesus said of him (Matt. 11:11, NASB), "Truly I say to you, among those born of women there has not arisen anyone greater than John the Baptist! Yet the one who is least in the kingdom of heaven is greater than he." Men, it is time to stand firm with a backbone and speak the truth, especially when it costs you. In reading Matthew 13 this week, I have been contemplating the significance of the Kingdom of Heaven. It is so powerful and influential, that if we understood its value, we would give up everything else to make sure we don’t miss it. But why are so many young adults missing it today? This passage gave me some thoughts on this question. 53 When Jesus had finished these parables, He departed from there. 54 He came to His hometown and began teaching them in their synagogue, so that they were astonished, and said, “Where did this man get this wisdom and these miraculous powers? 55 Is not this the carpenter’s son? Is not His mother called Mary, and His brothers, James and Joseph and Simon and Judas? 56 And His sisters, are they not all with us? Where then did this man get all these things?” 57 And they took offense at Him. But Jesus said to them, “A prophet is not without honor except in his hometown and in his own household.” 58 And He did not do many miracles there because of their unbelief. This passage makes me think of the importance of raising children well with the guidance of the Bible. With my experience of sharing the gospel on the U.F. campus, I have found that often the hardest of unbelieving hearts are the ones who came from a family who had some participation in a church. The children, now young adults, are familiar enough with God to think they understand and know Him. Their experience in their family and church has given them a corrupted understanding of God, often due to experiencing significant hypocrisy. When they get to college, their attitude toward God is “been there, done that.” They want to try something else, because “God” didn’t work for them. I approach my responsibilities as a son of the King, a husband, and a father with great fear and trembling, understanding that I have a great responsibility that is mysteriously woven into the sovereignty of God’s will. With that said, I am very thankful that God has left us with instructions for raising children. I can’t imagine life without a thorough understanding of the Bible, gained by simply reading it regularly with a heart to obey it. Doing this is the only reason that Lauren and I have any confidence with the decisions that we make regarding all aspects of our lives, especially with parenting. There is hope. We can turn our society around, but it is going to take Christian fathers who know and live the truth of the Bible and are, especially, worthy of honor in their own hometowns and in their own households, because the fruit of a life devoted to Christ is clearly evident in their leadership and service. 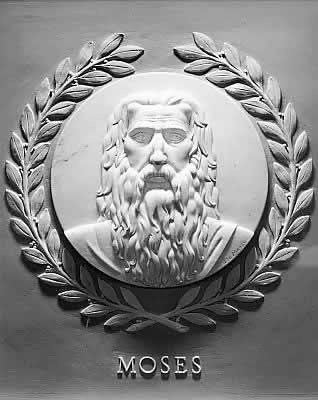 Moses marble bas-relief, one of 23 reliefs of great historical lawgivers in the chamber of the U.S. House of Representatives in the United States Capitol. Sculpted by Jean de Marco in 1950. Diameter 28 inches. The Israelites saw the great power of the Lord when he defeated the Egyptians. So the people feared and respected the Lord, and they began to trust the Lord and his servant Moses. I was sure to emphasize to my children that it is God who goes to battle for us and gives us victory (spiritually speaking). He is supremely powerful. I know I needed to read this much more than them! What battles are you facing that you simply need to trust God with and obey Him? 5 He saved us, not on the basis of deeds which we have done in righteousness, but according to His mercy, by the washing of regeneration and renewing by the Holy Spirit, 6 whom He poured out upon us richly through Jesus Christ our Savior, 7 so that being justified by His grace we would be made heirs according to the hope of eternal life. when we have faith that Jesus died to justify our sins and rose again to defeat the power of sin and death once and for all, and this gift of salvation is offered to everyone, apart from his works. 13 “You are the salt of the earth; but if the salt has become tasteless, how can it be made salty again? It is no longer good for anything, except to be thrown out and trampled under foot by men. 14 “You are the light of the world. A city set on a hill cannot be hidden; 15 nor does anyone light a lamp and put it under a basket, but on the lampstand, and it gives light to all who are in the house. 16 Let your light shine before men in such a way that they may see your good works, and glorify your Father who is in heaven. To be clear, Jesus could not have meant that our measure of works justifies our sins and allows for God to forgive us. This would have rendered the cross either unnecessary or not completely sufficient. If I simply conclude that it is sufficient to belong to a church that does good works regularly, but I personally don’t anything that my neighbors can value as good, how will they see my good deeds or my church’s good works and praise my Father who is in heaven? Additionally, I want to emphasize that if my aim is to be salt and light for my neighbors, they have to judge my works as being good. This means doing more than just communicating the message of salvation to them. They don’t perceive the value of the gospel until God opens their eyes and they understand it. My neighbors can perceive the value of me bringing their trash cans in for them or giving them some freshly-baked bread. If my only goal is only to share the gospel with them (the other side of the pendulum), I think I would short-circuit God’s way of showing them that what I claim to believe is really useful and good in this world now. If we Christians aren’t being salt and light in both a group and an individual, practical, and in daily way for our neighbors, then who will? Do we expect the unbelievers of this world to do good? Currently, the world perceives that it is unbelievers and secular groups doing all the good, so much so that Christians and churches have been “trampled under foot by men,” because, in their minds, rather than doing good, we are more interested in “hating” them, taking away their “rights,” and condemning them for their abominable practices. Therefore, I say that we must make every effort to be salt and light through a lifestyle of doing wherever and whenever. This is the primary, clear, and practical way that we demonstrate that our faith works, not just for the sake of eternity, but also for the sake of life now. Most unbelievers can’t readily relate to eternal things; they are just trying to survive now. If we make it our aim to live out our faith with a life filled with good works, we will be salt and make men thirst for the truth of Jesus. If we tangibly bless our neighbors, like an isolated city on a hill in a very dark land, they will be drawn to the truth. If all of us Christians live this way, our communities will be radically transformed and God’s kingdom will advance. He will be glorified! The enemy, the devil, has always understood the power of the tide of public opinion in influencing the culture. The Church needs to understand this. This is one reason why Jesus said that we must let our light shine before men (Matthew 5:16). When people perceive something as being "very good," they feel compelled to tell others about it. They feel compelled to promote it, make it known, defend it, and support it. If we Christians do the good things that God wants us to do in a very public way, this will help our society understand that what we believe and do is the solution to the world's problems (just like the people, in this passage, valued what Peter and John did). The loudest voices are doing their best to marginalize and falsely accuse us. Let us be wise and make use of the technology that God has given us to let the world know the good that we do. Let us choose to live out our faith in a very public way. For example, I thought recently, that when I read the Bible in public, I will read it the old fashioned way - with a paper Bible rather than on my phone. When my church is doing something good, I can easily take pictures of it and post it to the social media sites. I can easily promote the true meaning of Christian holidays among my neighbors and friends by decorating my yard and giving them small things to remind them of Jesus' significance in this world. Would our world not be quite different if we all did this?